As our hot summer ends, everyone needs to be sure not to push themselves too much. Often chiropractors will see patients who are trying to squeeze the most that they can out of the summer, and tested their limits. When on an end of the season hike or run, especially on a hot day, when the body is tired you may have end up with a sprained ankle. Inversion sprains, what most people refer to when they say they have rolled their ankle, are the most common forms of leg injury, and account for up to 85% of ankle sprains. The injury occurs when the one lands with the toes pointed down and slightly toward the bodies midline. This position ‘unlocks’ the joint, which means the joint is in position to injure ligaments, blood vessels, muscles and cause a lot of pain. Below is a picture that many of us are all too familiar with. 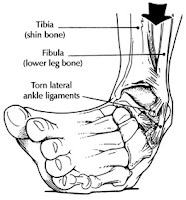 Because ankle sprains are so common, many people do not seek professional evaluation of their injury. This can lead to a lifetime of ankle problems. A good rule of thumb with any ankle sprain is to play it safe and see a healthcare provider who is trained in the joints, especially if you have difficulty taking 4 steps with the injured foot. The reason for this is that, even though many ankle sprains just stretch the ligaments, more severe sprains tear or even rupture them. Untreated torn and ruptured ligaments lead to future pain and injury. Luckily, most healthcare professionals are well trained at how to deal with the pain and swelling involved with any sprain. However a good doctor will also address rehabilitation of your ankle after the pain is gone (discussed after treatment). Some of the best joint specialists are chiropractors, as they spend over 4000 hours in school addressing the science behind proper joint motion. So I sprained my ankle, what now? 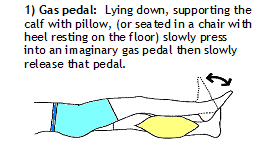 One of the most effective treatment routes for an inversion sprain is the adage P.R.I.C.E. What many people don’t realize is that swelling can cause damage to an injured area. Swelling stretches the tissues, prevents proper blood flow to the area and worst of all prevents or delays healing. Following the P.R.I.C.E guidelines will aid in recovery. Using the following before seeing a joint specialist will improve the healing process as well. P- Protect – prevent further damage. – Stop using the injured area use padding, protection, splints or crutches to take the weight off your ankle injury. R- Rest – Allow an injury time to heal. – Being brave and using an injured ankle is not wise. I – Ice – apply ice or ice pack to the injury (a pack of frozen peas will also work). – This will reduce pain and inflammation. Ice can induce hypothermia or a cold burn so wrap the ice in a cloth. Ice should be applied for ONLY 20 minutes with 60 minutes between applications, as ice can damage your body, even resulting in paralysis, if used improperly. C- Compression– compress the swollen area with an Ace wrap. – This will help to reduce the swelling. IMPORTANT–>If you feel any increase in pain, numbness, tingling, swelling or coolness below the wrap, you have wrapped it too tightly. Remove and re-wrap with less tension. E- Elevate – elevate the injury above the level of your heart. – This will help to draw the fluid from the ankle and decrease swelling and pain. After the extent of your injury has been determined and dealt with what comes next? Is P.R.I.C.E enough to achieve a full recovery? The fact of the matter is that even if the pain is gone, the tissues of a sprained ankle are weakened and more prone to re-sprain. So how does good doctor handle this? Simple, your doctor may adjust the foot to help restore neurological input to the healing tissues. They may use deep tissue techniques like cross-fiber friction, Gua sha or Graston to insure that the fibers of the healing tissues align in the appropriate directions. However, one of the most important things your doctor may do is to give you strengthening and proprioceptive exercises. Strengthening will help your muscles to prevent future injury and preconception, the ability to know where body parts are in space, will help you to prevent injury by avoiding ankle positions that make injury likely. These exercises will work with the adjustments and deep tissue techniques to ensure that you don’t go through another sprained ankle. An example of an ankle rehabilitation exercise. Also a good doctor will look at your knees and low back to see if they were injured when you sprained your ankle. These areas should also be screened during rehabilitation of your ankle, in case limping has caused any problems in the joints in these key biomechanic areas.